Would you like to export Mp3s of any bitrate directly from Sonar? Yes. No more messing around with third-party software for Mp3 encoding! 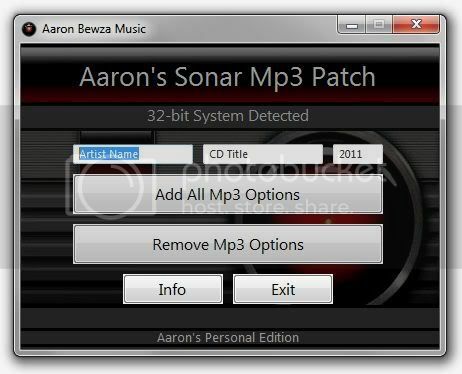 This is a permanent Mp3 encoder for all versions of Cakewalk Sonar which adds all available Mp3 options (44 of them) to Sonar's "Export Audio" dialog. and it also lets the User add tags which will show up in exported Mp3 files... namely Artist Name, CD Title, and Year. I'll be able to add more tags once Cakewalk fixes a bug in Sonar which severely limits the amount of data that can be sent to the encoder. The patch may be run at any time to change the information in the tags. It automatically detects if your system is 32 or 64-bit and creates either a 32 or 64-bit mp3 encoder (matching User's system) the first time the script is run. The encoder engines I use are Lame 3.99.b0, 32 and 64-bit. I included them into the script with rseding91's "Include virtually any file" function. I've also received a ton of help from lots of people here which I appreciate very much. ...and place everything in it. It is easiest to use the installer. Then all associated files the script makes are cleanly removed if/when you uninstall the program. Genre, Publisher, Encoded By, Copyright, Composer, Conductor, Band Description"
I hope you Sonar fans appreciate this one Thank you all for your support and guidance. "HKEY_CLASSES_ROOT\CakewalkExtAudioEncoders" with 44 subkeys in it. "%A_UserName%'s Sonar Mp3 Patch Logs"
The EXE's uninstaller takes care of removing them, or they must be manually removed if you are using only the AHK script. June 20th 2011: I've run into a small Sonar issue: If you are exporting separate tracks, the maximum limit is 256 at a time. I thought this was a bug with Sonar at first, but it is not... they've built it that way. So if you want to export more than 256 tracks at a time, do 256 and then do the rest. Solved: I tried to post the code here, but it is over 1200 lines and I kept getting errors trying to do it. I didn't know I could upload instead of post. [*:6k3ce3xr]I suggest you put other's code off in functions near the bottom; f.ex it is not necessary to read the code for detecting 32/64 bit while following the script, but only to know that is what is happening. Therefore, you could wrap that code up in a function and use "OSType := Get32or64()" or similar. Needing to read through the tedious calls used in that merely breaks the flow of the script. [*:6k3ce3xr]Also, DYK that the contents of continuation sections can be indented by using the LTrim option? [*:6k3ce3xr]You might look into Gui +Label as you have at least 7 of them. [*:6k3ce3xr]Consider using RegExReplace instead of 6 lines of StringReplace, I can help you there, as can several others. You don't have an email program! has been copied to your clipboard. This is harmless, yet useless. you rock nimda! you are correct, even I am having trouble now keeping track of the various subroutines and sections. I see what people mean when they say they like readable code. That is (hesitantly) next on the list to do, cleaning this silly thing up and making it more presentable. Although, I tried moving the section "Checks for tags from misc\tags.txt...." down to the bottom and making it a subroutine, but that mangled the edit boxes completely... at that point they would not show on XP unless i used TAB to cycle through them or if I actually clicked on them. weird. I am going to investigate the Ternary Guide... if I'm not mistaken, that allows things like delimiters (...|...|...|...) which I remember from earlier. seems to make the progress bar disappear. awww I have to run away for a few hours, wifey is home soon and we are going to watch a movie. Believe me though, I'll be back to read your words of wisdom. Don't pull any punches because you might hurt my feelings... I can take it lol especially if it improves this particular script. I think I was grumpy earlier from not having a smoke. I've gotten rid of the legacy SetEnv lines. ; You realise "Sleep 1" generally sleeps about 15ms? ARGH! I did not see Nimda's recent edits above... so I've bumped this thread WAY too early. It looks like I have more suggestions to read through! thank you Nimda... that looks like valuable stuff, I'm on it right away ...I've been gone a few days. I took that advice and tried to clean the script up the best I could. I replaced a few legacy commands, moved some subroutines to the bottom area etc... I also added a function to clear the edit box when the User double-clicks in it with the left mouse button. I'm understanding function calls more clearly now reading is good stuff. I looked into using Ternary to compact repetitive IfInString commands, and that is a novel idea to wrap them like that but I think I prefer the readability of the original default method. I stumbled onto a fascinating bit of info (fascinating for me anyway)... having to do with sequential patterns using Loop. I'd like to perhaps name all the created registry keys using a Loop function, from 1 to 44. When I understand more about this I will try to integrate it. HKEY_CLASSES_ROOT is where Sonar places a folder for external Mp3 encoders to hook up with Sonar, so it needs to be at that exact location... all of Sonar's patching in with other software is done here (I think). I removed some unnecessary escapes, and looked at the bottom "Return". Does a script automatically "return" when it reaches the bottom? I think it adds a sense of ending to it, even though it may be useless. "Gui 2:+LabelMyGui" seems an awesome way to shorten some attributes of multiple GUIs. It seems quite similar to CSS in a web page. 1.a)I'd like to stress you can indent the contents of a continuation section with the LTrim option. 3.) You don't need to check with IfInString before using StringReplace; StringReplace will simply have no effect if the string to find isn't in the haystack. --- wrapping up the stuff that detects 32 or 64-bit system into a function sounds great but I'm not understanding how to make it work correctly. If I bundle this one to the bottom of the script, "CD Title" and "Year" edit boxes do not show up at all on XP until mouse is positioned over them. --- I figured out LTrim! awesome stuff. --- instead of using %A_ScriptDir%, I used %A_WorkingDir% because for now, the "portable version" of this thing is only a copy of itself, and if it is run from somewhere else, it will create the "32or64-bit\Lame.exe" file in an incorrect location, and Sonar will throw an error when it tries to find it. I will change this once I include an actual portable version which gets written to the proper location. --- ControlFocus did not want to happen for me. I used "GuiControl, Focus, Artist"
I've tried with and without quotes, with and without escapes, no success at all ^^^ I wonder if I'm doing it right, can one line of RegExReplace take care of all the above? I tried /Q...../E as well with no change. Removing all the quotation marks from those strings (except the first and last ones) and adding backslash escapes to the remaining quotation marks is what I'm trying to do. --- Including variables inside the tooltip functions (instead of setting global variables) sounds great as well... I'm still trying to understand how it works. I'll be working on the stuff posted in red. This is awesome, I'm learning more and more. Read that page. I don't see how you managed a 1000 line script without knowing how to call functions :? "They all go down to singles"
This is very reliable, instead of your long line of stringreplaces. [*:9vjwp4k3]Turns out, you don't need %A_WorkingDir%\file.ext , because A_WorkingDir is where the script works. Instead, file.ext will do fine. [*:9vjwp4k3]You still require the script to be in A_ProgramFiles. Please, please use SetWorkingDir, %A_ScriptDir% instead! Updated to version 5.42 in top post. I'm very happy you've taken an interest in this script, Nimda. I was successful on 4 of the 6 points you made last post! I have figured out that functions are just like subroutines, there is nothing complicated about making one. I also got the smooth tooltip hover text working, it is not flickery at all, it is very smooth. 6: Yes, the script is installed and needed in A_ProgramFiles, but the "create portable version" function makes a copy of the script wherever the User chooses. The "write encoder" function has to write to A_ProgramFiles in order for Sonar to locate it when it is used... it needs to be in that location. Until I build a small portable version to include, I can't use SetWorkingDir at %A_ScriptDir% yet... or it will create encoders all over the place which Sonar cannot find. I fully understand what you mean, though WorkingDir will change to %A_ScriptDir% soon. I hope I'm somewhat meeting your expectations... I love this stuff, it is very rewarding.